Extreame Savings! Up to 44% off on Menu & Check Displayers at High IQ Business Network. Top brands include Waiter Wallet, Mymazn, Sonic Server, CompassLongview, MenuCoverMan, MaryOnArt, & DayMark Safety Systems. Hurry! Limited time offers. Offers valid only while supplies last. 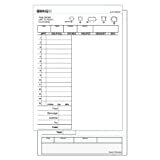 MenuCoverMan Chipboard for Cafe Menu Covers for 8.5" x 11" covers. #CHIPBORD0811. Quality chipboard stiffens tall and large menu covers so that they don't flop over. Packs of 50 Chipboards. 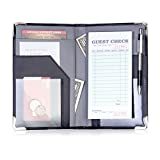 MenuCoverMan-25 Menu Covers #3117 BLACK 1-PANEL-2-VIEW-8.5"x11"-DOUBLE-STITCH Leatherette Edge- Browse hundreds of great menu covers now-Type MenuCoverMan in your Amazon Search. 25 BETTER QUALITY #3125 BLACK DOUBLE PANEL - 4-VIEW - 8.5" WIDE x 14" TALL - DOUBLE-STITCHED Leatherette Vinyl Sewn Edge. Gold metal corners. SEE MORE: Type MenuCoverMan in Amazon search. 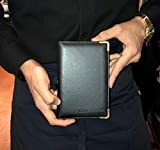 24 Menu Covers • 8.5" Wide x 11" Tall • 100% USA-MADE Commercial Quality • SoloPanelStyle TopOpen OnePocket 2-View AllClear MCM-ACV-100-8.5X11 • SEE MORE: Type MenuCoverMan in Amazon search. 12 Menu Covers • 5.5" Wide x 8.5" Tall • 100% USA-MADE Commercial Quality • BookletStyle SideOpen 3 Pocket - 6 View. All Clear Vinyl ACV-61-5.5X8.5 SEE MORE: Type MenuCoverMan in Amazon search. MenuCoverMan Chipboard for Cafe Menu Covers for 8.5" x 14" covers. #CHIPBORD0814. Quality chipboard stiffens tall and large menu covers so that they don't flop over. Packs of 50 Chipboards. 25 BETTER QUALITY #3605 BROWN NYLON FABRIC EDGE DOUBLE PANEL - 4-VIEW - 8.5" WIDE x 11" TALL - DOUBLE-STITCHED. Gold metal corners. SEE MORE: Type MenuCoverMan in Amazon search. 25 BETTER QUALITY #3120 BURGUNDY SINGLE PANEL - 2-VIEW - 8.5" WIDE x 14" TALL - DOUBLE-STITCHED Leatherette Vinyl Sewn Edge. Gold metal corners. SEE MORE: Type MenuCoverMan in Amazon search. 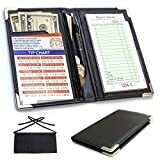 MenuCoverMan • PK/12 Menu Covers-8.5" x 11" 100% USA-MADE Booklet Style-Side Open-3 Pocket-6 View. 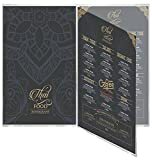 AllClear VirginVinyl-ACV-61-8.5X11 Browse hundreds of menu covers-Type MenuCoverMan in Amazon Search. 25 BETTER QUALITY Menu Covers #3611 BROWN NYLON FABRIC EDGE TRIPLE PANEL - 6-VIEW - 8.5" WIDE x 11" TALL - DOUBLE-STITCHED. Gold metal corners. SEE MORE: Type MenuCoverMan in Amazon search.